Concussions and brain injuries have been a hot topic in professional and college sports lately with the majority of attention focused on the dangers suffered by the men who play football. Let’s just focus on college athletics. 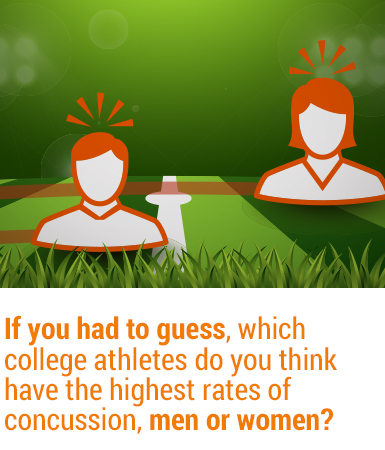 If you had to guess, which college athletes do you think have the highest rates of concussion, men or women? And what sport? According to NCAA data, women’s sports account for five of the 10 college sports with the very highest concussion rates. Women’s field hockey, soccer, and ice hockey are the most concussion-prone female college sports. Athletes in those sports suffer concussions at a higher rate than men’s soccer, baseball, and basketball. Why Are Women’s Concussion Rates Higher? The public knows little about the relatively high rate of concussions in women’s sports because those sports don’t get the same amount of exposure as men’s. At many NCAA institutions, men’s sports such as football and basketball are top earners for the whole athletic department, leading to significantly less attention for women’s sports. This creates problems when it comes to researching and collecting data, because scientists don’t have as much information on female brains and concussion effects. Many scientists agree that just because women generally have smaller bone and musculature structures, they may be more susceptible to head trauma. Another problematic factor in diagnosing and treating brain injuries is how different each injury manifests itself. As we’ve seen in some of our brain trauma cases, these injuries are highly unpredictable and can be tough to see with the naked eye. It takes time and expertise to properly diagnose a brain injury, and that process should be equally attentive and effective for athletes at all levels and all genders. With this in mind, how can female athletes better protect themselves from sustaining concussions? First and foremost, the brain safety rules need to be the same for both men’s and women’s sports. For example, men’s lacrosse has mandated helmet use since 1928, while only the goalies in women’s lacrosse are required to wear helmets. Keeping safety rules the same across most NCAA contact sports might also be a good start towards cutting down on concussion rates. While protecting high school and NCAA athletes is important, concussion education, treatment and prevention should start early in an athlete’s career. One proposed act from Congress had the right idea but failed to garner enough support to move on in the process. The ConTACT Act (Concussion Treatment and Care Tools Act), which died during the 2010 Congress, would have led to the the creation of national guidelines for identifying concussions and creating a protocol to monitor when an athlete should be cleared to play again. The main goal of this act was to protect school-aged children from concussions and other head injuries and to foster research and learning about how the brain heals so as to improve injury maintenance down the road. It’s time to fire up your congressman to revive this act immediately! Regardless of gender, sports-related head injuries are something we can continue to learn from, and hopefully aim to lower injury instances across the board. This entry was posted in Blog, Brain Injury. Bookmark the permalink.